For a juicy morsel of insect flesh, survival in the Sonoran Desert often includes multiple strategies to avoid the many insectivorous birds and reptiles. This one has excellent vision provided by large compound eyes. The eyes, and indeed the whole insect, are patterned and shaded precisely like the weathered rocks where it often rests and feeds. Now add a powerful pair of jumping legs and concealed membranous wings that can be deployed in fractions of a second should the need arise! 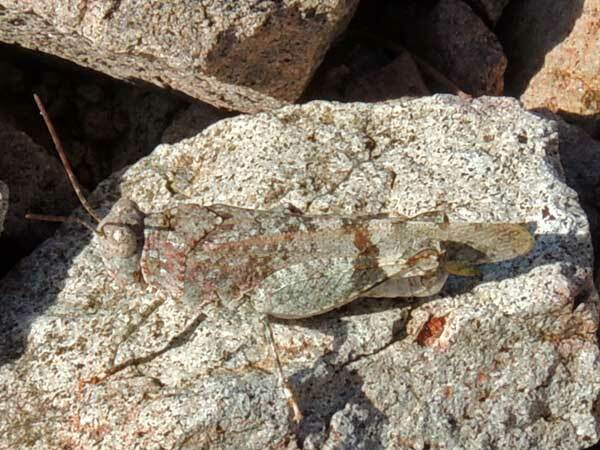 Still many grasshoppers are discovered and eaten thereby selecting for grasshoppers ever more perfectly camouflaged. This small grasshopper can be found on the wing pretty much throughout the seasons.